Catholicism has been ingrained into the past of Western and Eastern Europe since the Romans started to bring it into the region. When the Roman Empire split apart and the western portion fell and kicked off Europe’s dark ages, the Pope’s influence stayed. As Europe began to reorganize itself and form the nations that survived into the Middle Ages and onwards, great churches were built, and small communities formed around them. Bishops of certain regions could become quite powerful and wealthy by controlling several services, such as marriage and other blessings. The Pope himself became one of the strongest political powers in Europe. His ability to sanction the rule of feudal lords and even when wars could be waged amongst the fiefdoms made it so that kings and queens bowed to his will unless they wanted to risk being excommunicated. Europe accepted Catholicism’s beliefs until the appearance of Martin Luther and Protestantism, and by then Catholicism had had a hand in shaping much of Europe’s culture. 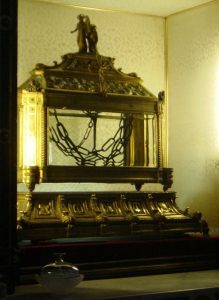 The chains of St. Peter, located at San Pietro in Vincoli in Rome. A core tenet of Catholicism is that life is transitory and fleeting. Jesus Christ offered his own body and blood to his followers on the evening before his death. This world is soon to be lost, and sights should be set on the world beyond. A preoccupation with death could be seen in much of the art and music of the Middle Ages. Physical things were just as transitory as life itself in these tumultuous medieval times. Bodies themselves became a means to an end. Flesh and blood and bone were temporary things, meant to be used and spent. Is it any wonder, then, that the cathedrals of the times would incorporate this belief into their operation as great moneymakers? Churches competed with each other to attract the faithful, as these worshipers were obligated to support the clergy with a tithe of their own wealth. Part of this wealth would go to the local priests and church before the rest went to the Vatican. One of the ways that these parishes would attract laypersons would be to display “relics”. Relics were the personal effects or the body parts of a saint, someone who Catholics believe to be so faithful that it is certain that they have gone to Heaven. To the peasants of the Middle Ages, a time fraught with pain and chaos where any real sense of order was held together by the whims of the powerful, the chance to see a lock of hair or set of robes or part of the skeleton of one of these departed faithful must have been a reminder of a better life waiting for them if they kept their faith in God. Relics were relief to the masses, and a lucrative tool for both priests and the individuals that could procure them. So, then, is the skull of St. Vitus in Old Town Bridge Tower really his skull? Probably. It was brought to the city by King Charles IV of Prague himself, and a king would probably have several Church officials with connections to Rome ready to confirm the authenticity of a relic. Similarly, the arm of St. Vitus was brought to Prague by Duke Wenceslaus of Bohemia, the adored “Good King Wences” who himself was a Prague local and was eventually canonized as a saint. Kings would have direct incentive to have their relics as verified as possible. After all, imagine the backlash from the Pope if he found that the nobility were displaying false remains. Still, there is the potential out there that several relics on display in the present day were pulled from desecrated tombs in the distant past and set up to help turn the minds of the faithful towards the grave. After all, the living world and what it can do to the bodies we leave behind is a distant concern in the afterlife. 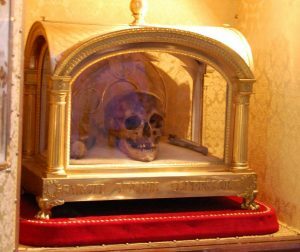 The skull of St. Yves in Brittany, France. Photo by Derepus from Wikimedia Commons.